Cassie was my colorist/stylist and she did a fabulous job and i literally felt like a new person when she was done :) plus she’s friendly and nice, thanks! Harriet is a fantastic stylist and always suggests different colours and styles that suit my hair. I recently had an undercut and I’m so in love with how much easier my hair is to style! The friendly atmosphere and fantastic staff are what makes Moda brilliant. Thankyou! As always I walk away feeing like I have been sat with a friend chatting and catching up while also having a great hair cut. All the employees are lovely and Tina ensures her business ethics of customer service and top quality spreads throughout her work force! I was very pleased that despite not having made an appointment I was able to get a walk in hair cut on Monday. Everyone was very friendly and welcoming and my stylist was very skilled and helpful. She explained what she was doing and gave me the hair cut I wanted. I walked out feeling fabulous. I would defiantly recommend Moda to friends. Thanks so much for Ella‘s beautiful prom hair !!! A lovely, friendly salon with bubbly and hard working staff. The best haircut and colour I've had in years. Attention to detail and excellent 1:1 service. Thank you Lauren! ive Honestly never had highlights that have been exactly what I wanted before. I went from a box dyed dark brown to a gorgeous summery light ashy brown with blonde hints. The colour is completely what I had imagined and Lauren did it so well ! I’m so happy with it and keep getting so many complements!!! Tina was very welcoming, understood exactly what I wanted done. I felt at ease with her. I will definitely be back. Big fan of moda hair. The staff are very friendly and always give me a great cut! My first visit to MODA. A cut by Lauren, I was so impressed I booked a colour change, being a certain age I thought it time to embrace my grey! A very professional,talented young women. Will definitely return and have already recommended the salon to others. Harriett senior stylist cut my 12 year old daughter Alana’s hair to perfection. The salon is friendly, professional but also has a great atmosphere. Alana loves her hair and we can not recommend Moda enough. Great service as usual from Tina and her team. Cassie did an amazing job fixing my long out of shape hair, she really put me at ease and I’m so happy with the result. Thank you! I came in to Moda with lots of frizzy hair. I have been dyeing it at home for many years so there were patches of unwanted dark brown/black combined with reddish brown, plus a very noticeable parting with grey roots & lighter red which glowed in a way you don't want. I left Moda with evenly-coloured reddish-brown glossy hair, looking & feeling fabulous! They looked after me from the moment I arrived & made me feel very welcome. I was confident that they knew what they were doing as they talked me through each step on the colour correction process, easing my anxieties. It was a pleasurable experience, especially when my head was massaged while the conditioner did its work improving my hair's look & feel. I would recommend them to anyone with damaged hair who needs a makeover. Tina & her team are amazing! 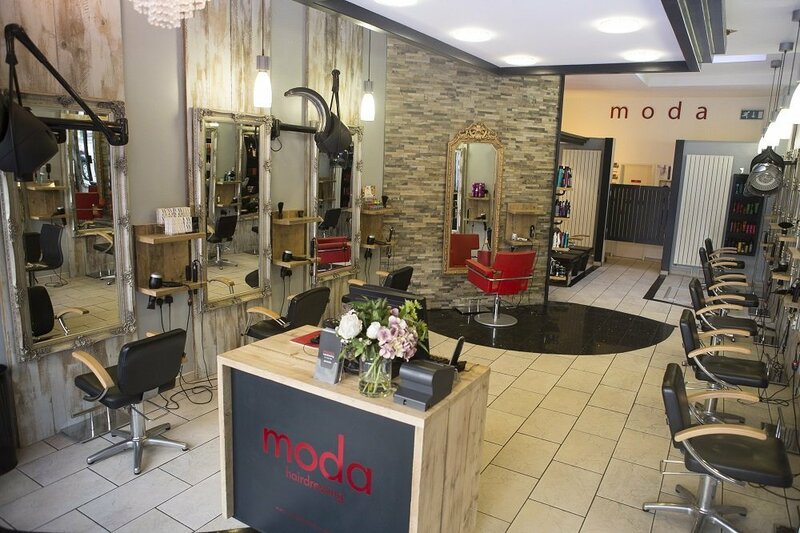 Was nervous to find a new hairdressers after moving to Bristol but I’m so glad I chose Moda. Tina is an amazing stylist and her and the rest of the team are all so lovely and welcoming! Would definitely reccomend. Always a pleasure to have my cut my Tina. Always have a good laugh and leave with a fab new do! Wouldn’t go anywhere else! Thank you, really nice staff, really pleased with my hair. Will be coming back. Thank you all! Lovely friendly relaxing atmosphere. Great stylist Bev.